We went to the Marriott Rugby 7’s at Twickenham on Saturday. It’s not your standard day at the rugby which, as far as I can gather, is usually a more civilised affair. By ‘civilised’ I am referring to the lack of scantily clad people stumbling around the stadium in varying degrees of fancy dress. There’s a theme each year to help guide the 50,000 rugby goers as to what to put on. In 2011 it was ‘Beach’, which is just an excuse for people to wear next to nothing. This year was 70’s disco and was pretty much an excuse for a lot of people to wear next to nothing. The advantage of beach as a theme is that anyone can muster up some sort of costume out of something they already own. Not quite the same with 70’s, which, if you are to do it properly (think Travolta, Saturday Night Fever) then there is a certain level of investment that you’d have to put in to pull it off. I spent almost an hour in the party shop before the event (I know what you’re thinking: hard life), working out the best, and most cost efficient way, to pull off the 70’s disco look. Normally a flutter on something ridiculous wouldn’t be a problem, but I’ve vowed to be more responsible with my spending and to prioritise the necessities. On this occasion, eating and the mortgage took president over psychedelic flares. 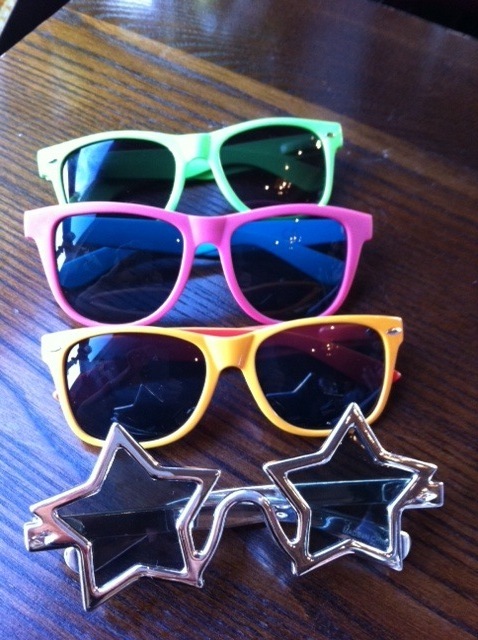 In the end I got a couple of pairs of ridiculous sunglasses, a medallion and a stick-on moustache. None of the above were for me but did create quite a convincing ensemble and the boyf was quite pleased. However, seeing as the tash was the first thing he did after brushing his teeth (we didn’t leave until after lunch and he was excited) it was no surprise that a gust of wind took the tash along with it. The usual suspects of Primark and New Look didn’t come up trumps for any disposable disco gear so I had to make do with the contents of my wardrobe. It was a disappointing effort, I have to admit, and I got severe costume-envy when I got there. Nonetheless, there were some brilliant costumes and one of my friends never disappoints on the fancy-dress front. He’s been glow stick and MC Hammer at the last few parties and on Saturday he officially joined LMFAO. Neon was the order of the day and at least we could find him at the bar. What we really needed were afro wigs. On the way there, the bus was packed with them and I knew that was the error of my ways. 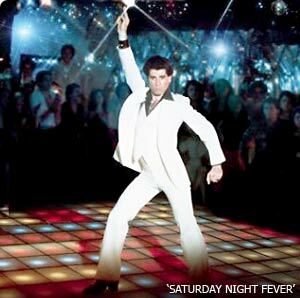 In theory – it doesn’t really matter what you are wearing, an afro would have screamed ‘disco fancy dress’. Lesson learned, when it comes to fancy dress from now on, I’m going big, or I’m going home.